Glass reinforced plastic or, more commonly, fiberglass, is a composite material made from strands of glass and liquid resin. This versatile material is used in the construction of cars, trucks, motorcycles, boats, aircraft and any number of domestic and industrial items. Fiberglass is also an easy material for the DIY modeler or repairer to use. Here, Keith Noakes provides a comprehensive practical guide to the use of fiberglass wherever it is encountered or needed. Written with the layman in mind, this book covers materials, tools and equipment, health and safety, repairing existing components, modifying and strengthening existing moldings, designing and making patterns, making moulds, wet lay-up technique, curing times and methods, releasing compounds from molds, and resin casting. From repairing a simple crack to molding a complete race-car body. 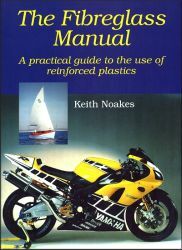 The Fiberglass Manual shows you how, and will be invaluable for all car, motorcycle, boat, aircraft and DIY enthusiasts. Keith Noakes has extensive experience and knowledge of glass reinforced plastics, having worked in the industry for over twenty years. During that time, he advised motorcycle and motor racing teams on the use of composite materials for frames, chassis and bodywork, and formed his own company supplying components to Formula One and CART teams.